Become a Champion of Virtual Meetings and Conferences – And earn Continuing Education Credits! In our highly digitized society, your professional meetings and events can no longer be limited to a single physical location. But do you know the range of available technologies, proven strategies and best practices? Do you know how to make your next event accessible to virtual participants? The Meetings Without Walls course is designed to give you exactly the knowledge and resources necessary to put you on the virtual meetings path. Earn your Certified Virtual Events Producer™ (CVEP) certificate, and membership to the iCohere Academy, the largest worldwide professional hub dedicated to the evolution of virtual events. The course also introduces a marketing toolkit to simplify event marketing. Understand the terminology and concepts behind webinars and virtual meetings. Create the business case for implementing hybrid and virtual meetings. Select the virtual software system that is best for your organization. Form your project team and train them on virtual meeting practices. Produce highly effective webinars and/or hybrid and virtual meetings. Create successful marketing campaigns to promote your events. Evaluate the ROI of your virtual meetings for training, communications and collaboration. "It gave me an overview of virtual meetings and the process involved with hosting a successful virtual meeting or conference. The course is very detailed and covers a lot of good information." "Very easy to follow the instructor; information presented in easy to understand language and format; not technical jargon." "Packed with good topics making it easy to justify to management that I should spend the time taking the course." iCohere is a CMP preferred provider. 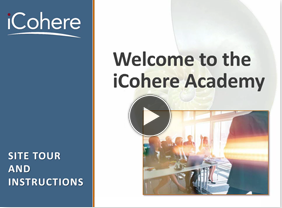 Earn your Certified Virtual Events Producer™ (CVEP) certificate, and become part of the iCohere Academy, the largest worldwide professional hub dedicated to the evolution of webinars, web team meetings and virtual conferences. Our courses contain no advertising. We will never sell or share your course profile information. You will find our course material valuable regardless of what software vendor you use for virtual events. The course is vendor-neutral and illustrates concepts with examples not only from iCohere and its clients but also from a wide range of other vendors. Although iCohere is a virtual events software vendor and we strive to expand our association/non-profit business, we also maintain a firewall between our educational and promotional programs.